Umar Aziz paid�the price for sporting a beard in China. Scarred and scared, the 31-year-old Uighur from Hotan -- in the Xinjiang Uighur Autonomous Region in China -- has now gone underground in New Delhi. Because though the UNHCR has organised a visa for him to go to Sweden, the Indian government is yet to clear it.�And each day brings the possibility of Bejing demanding his extradition as a terrorist. In an exclusive and emotional interview with rediff.com, Aziz spoke of�how and why he fled "the cruellest country in the world." A farmer by profession, Aziz has studied only till class five. A practising Muslim, he offered namaaz five times a day at his home and sported a beard. The Uighurs of China's restive Xinjiang province claim descent from Genghis Khan and are predominantly Muslim. Once constituting an independent Republic of Eastern Turkistan, the Uighurs live uneasily under Chinese rule, alleging economic, cultural and political suppression. All was well with Aziz till one day in 1995, when he and his wife were taken into custody by the Chinese police. He was charged with�sporting a beard, seen as a symbol of Muslim identity and a rejection of Communist philosophy, and supporting the anti-China movement. He was tortured and beaten�on a regular basis for four long years before being released. His wife died in police custody. The anti-China campaign was gaining momentum when Aziz came out of jail in 1999, and separatist groups in Xinjiang were blamed for several bomb blasts in China during that�period. The Eastern Turkestan Islamic Party of God, established in 1993 to establish a separate Uighur state in Xinjiang, was allegedly responsible for these attacks. Aziz, however, said he subscribes to the ideas of the East Turkestan Uighur Congress Party, also�known as Demograsia, which advocates a peaceful struggle for independence. "We are not terrorists," he said. "We don't believe in violence. But they [the Chinese government] call us terrorists. They call us American agents. We have nothing to do with America. We want our separate homeland," said Aziz in broken Urdu, a� language that he has learnt only after his escape from China. 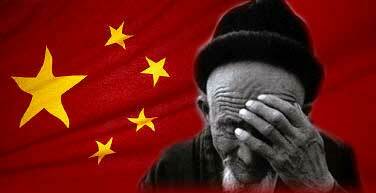 "China captured our country 55 years ago. We want to live freely and with our religious identity. We want to practise our religion freely. China is the cruellest country in the world." When he came out of jail in 1999, he joined the growing anti-China movement. "There was a strike and I was among the protestors. We were about 100 people. I urged others to join us. I used to write posters. "On that day we had a protest march in the heart of Hotan [town]. I was carrying the placards." Aziz and many of his colleagues were identified by the police. And the searches began. Many of Aziz's friends and relatives were interrogated in brutal fashion by the police to get his whereabouts. His father and elder brother were arrested and are probably still in jail. His mother, younger brother, and sister fled and are apparently living in the jungles near Hotan.�"I am not in touch with them," Aziz said. "But if they are alive, they must be in the jungles." Under pressure, Aziz and his friends decided to escape to Nepal via Tibet and seek political asylum. "Our objective was to reach Nepal and seek asylum from the UN. "We were 40 when we left Hotan. But only two of us could reach India. The rest were either arrested or killed or just disappeared on the way," said the well-built man, tears trailing down his cheeks and disappearing into his thick brown beard. It took Aziz and his companions more than six months to reach Nepal's capital Kathmandu. "I had 1,500 in Chinese currency when I left home," he recounted. "I also had some clothes and food. I never thought the journey would be so long. Everybody pooled in the money as much as we could." Trains were being checked thoroughly, so they didn't take a direct route to Tibet, or Xizang as the Chinese call it. Instead they�travelled short distances by bus. "The police had our photographs. There was checking at the district borders. We had to be extremely careful," he said. From the jungles of Hotan, (where eight of them were killed in police firing), the group went to Korla, Hami, Khumul, Dunhuong, Lenghu, and�Golmund before entering�Tibet. They travelled by bus and alighted before the border checkposts, crossing over furtively in batches of four and five at night. If one group got caught by the police, others turned back and preferred to stay on till the situation cooled down. "This way it took us a lot of time to cross each district," Aziz explained. "We always feared that those who were caught would give information to the police about our hideouts. So we kept changing places.�Some of our friends were caught. But, fortunately, police could not trace me all the way. "When I saw police dragging some of our friends, there was no way other than to run and hide," he recalled. Eight persons in the group were killed in police firing in the jungles of Hotan. The group kept getting smaller at each station. They bought five camels from a shepherd on the way�to ferry goods and have occasional rides. As they reached Korla, 17 more were caught. "We could not even think about those who were caught," said Aziz. "We had to keep running. The Chinese are very cruel people." Some also fell ill on the way, but Aziz was among the lucky few. "Shepherds were of great help," he said. "We bought food and other things from them." Finally, the group reached the Tibetan capital of� Lhasa, where they rested and recuperated for 25 days. "Tibetans helped us a lot. We were feeling at home in Tibet. We share the same plight and hopefully both will get freedom one day." Finally, Aziz and five others decided to leave for Nepal. But they were caught by the Nepalese police as soon as they crossed the border, and�jailed for seven months until the United Nations High Commissioner for Refugees�intervened. "The UN office in Kathmandu pleaded our case and gave us refugee status," said Aziz. All six were released, and lived there happily for about two years. Aziz learned Urdu while living with some Muslims in Nepal. "Nepali was difficult so I preferred Urdu. It is close to Arabic. I know Arabic," he explained. But one day a local newspaper ran a report on the refugees, that too with a photograph. A few days later, the Chinese embassy�demanded custody of all six,�calling them terrorists. According to Aziz, four of them were handed over to the Chinese authorities. One was executed, while the other three are in jail. Aziz and one other man escaped to India, arriving in New Delhi on October 5, 2002, and sought help from the UNHCR's local office. The UNHCR's staff�asked an Afghan refugee to give Aziz shelter in his rented house in Hauz Rani in south Delhi. In November, Tariq Nasir, 26, also reached New Delhi via same route. Abdushakur, 31, arrived in May. Now as many as eight Uighur refugees live in New Delhi at two different places. Aziz, Nasir and Abdushakur lived in a two-room rented house in Hauz Rani, for which they paid Rs 2,500. Two of them get Rs 1,400 a month from the UNHCR office. This is their only source of income.�"We don't get jobs here. There are so many problems. We want to migrate to some other country where we can start life afresh," Aziz said. "In Nepal we used to get Rs 3,000 a month. It was better there." Though Aziz and Nasir have got visas to go to Sweden, they�are waiting for the final clearance from Indian authorities. Until then, they fear that�Chinese spies might report their whereabouts to Beijing, which will immediately demand their extradition. Abdushakur's immigration papers are stuck in Nepal. "We hope we will have a better life in Sweden. The movement [for a separate state] has almost died in the last five years. All activists are in jail in China or living as refugees," said Aziz. "Let us see what Allah will do for us." Sub: this is all made up (fictional). journalist even got geography wrong. Sub: O Oval, are you listening ?